Installing an exhibition banner or two is one effective way you can attract people to your booth at any expo hall or trade show. Such a banner will not just serve as part of the decorations for your booth. You can also use them to convey information to your target audience, information that is supposed to intrigue them and make them want to stop by your booth and learn more about your products and services. 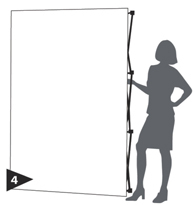 Our 3×1 straight pop-up fabric walls will help you get the job done. 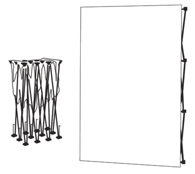 Our 3×1 straight pop-up fabric display is a compact banner stand, made up of a straight frame and a fabric graphic. The frame is three cubes high and one cube wide. It measures 787mm/W x 330mm/D x 2260mm/H and has a polished silver finish. The fabric wall is full colour and attaches to the frame using Velcro strips. You can order this display single-sided or double-sided; most customers prefer double-sided displays to make the most of their booth’s space. 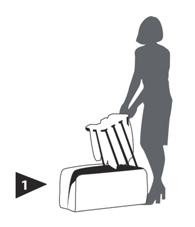 The 3×1 pop up fabric wall package comes with its own handy carry bag. If you need a spotlight for your exhibition banner, you can order extra halogen lights for that purpose. You can combine this fabric wall along with other exhibition stand ideas to maximise the drawing power of your booth space at the expo hall. In the future, if you need new banners, it won’t be necessary for you to buy a new frame-and-fabric-graphic set. You can reuse the frame and just order a new fabric graphic to set in the place of the old one. This fabric wall is a cost-effective solution for your display needs. Our 3×1 straight pop-up fabric banner is easy to set up. 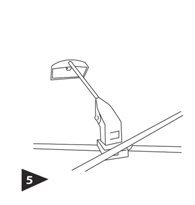 More importantly, it is quick to set up, taking no more than five minutes to do so. 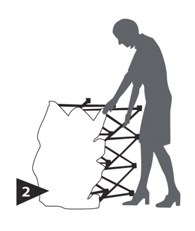 You only need to take the frame out of its carry bag and pop it up to make it stand to its full height and width. Then you fasten the hooks behind the frame as well as let out its feet so that the frame remains stable throughout the exhibit. Lastly, you attach the fabric graphic to the frame with the aid of its Velcro strips. If you need an exhibition banner, our 3×1 straight pop-up fabric wall will fit the bill perfectly. 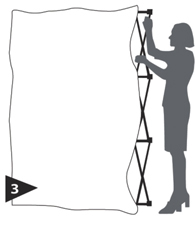 It will make your booth more attractive and draw in the crowd at any expo or trade show. Call us right now to find out more about our display solutions.